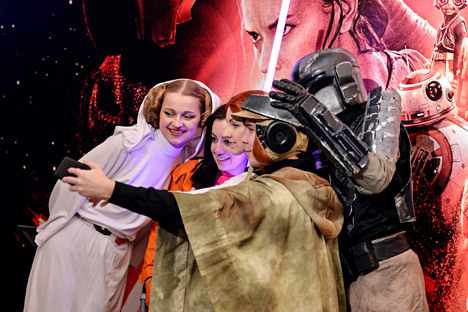 Visitors at the premiere of the movie Star Wars: The Force Awakens, at the Karo 11 Oktyabr movie theater in Moscow. Latest instalment in franchise makes $1.1 million before Russian premiere. The latest edition of George Lucas' legendary Star Wars movie franchise sold 177,683 tickets and generated about 80 million rubles ($1.1 million) in advanced sales in Russia, surpassing the record previously set by Fifty Shades of Gray, which made about 50 million rubles ($708,000) in pre-sales. The figures, which were valid as of 7 p.m. Moscow time, Dec. 16, were reported by the Unified Automated Information System (UAIS), which collected data from 689 cinemas. While Fifty Shades of Gray sold more tickets the day before its Russian premiere - almost 197,000 (at 589 theaters) - Star Wars: The Force Awakens is being screened in more expensive formats – 3D, IMAX and LUXE. The official premiere of the seventh part of the Star Wars series opened in Russia on Dec. 17. The screening rights were obtained as late as Dec. 14. However, since mid-November, theaters have been providing customers with a reservations service: Users pay a reservation fee (and in some cases reserve a seat without paying a fee), and get their tickets after the film receives a screening certificate. In Russia, ticket reservation and pre-sales, especially in weeks ahead of the premiere, are a rare practice; it is done only in the cases of very big franchises, sources from film distribution companies told the RBK business daily.